I stole the above photograph from Jon Catuccio, who runs the Stereolist.com website. I got to hang out with Jon quite a bit during AXPONA; I've been writing reviews for him over the last few weeks and it was great to put a face to the name. Jon's a fairly young guy, which gives me hope for the future of high-end audio. Like Lance Kimmons of the Austin HiFi Society, Jon is extremely knowledgeable about audio--much more so than when I was his age. Jon also loves a good Cuban cigar, which makes him aces in my book. The above photo is of the YG Acoustics speakers. (His photos are much better than mine, so I'll use 'em.) YG earned a bit of consternatation among the audio industry when they first appeared a couple of years ago for saying they made "the greatest speakers in the world" in all of their ads. Usually this type of hyperbole is greeted with contempt because most knowledgeable audiophiles feel that there is no "best," only differences in preferences. 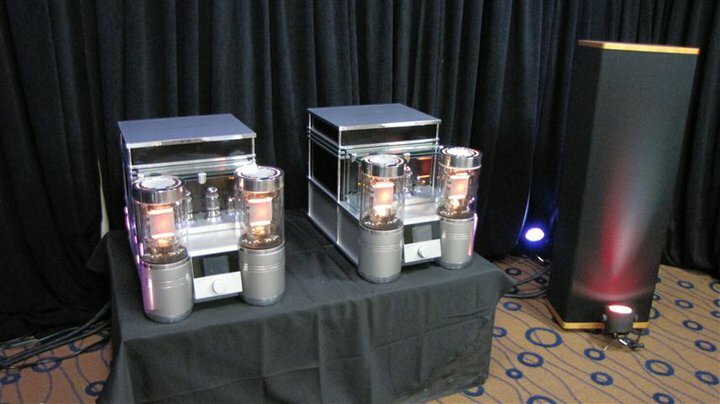 Many attendees I talked to (along with a few of the bigwigs at Stereophile magazine) are starting to think there may be something to YG's claim. I first heard the YGs at CES ealier this year, and I felt that they were definitely among the finest speakers I've heard. They sound so precise and so coherent throughout the frequency extremes that they are able to achieve an unbelievavble level of realism. Well, word has it that they've made a few modifications to the upper section of their speakers (the one with the midrange-tweeter-midrange array), and they're even better. While I don't think I prefer them to the slightly more organic and warm balance of the Trenner & Friedl Dukes, they certainly make a compelling case for themselves. 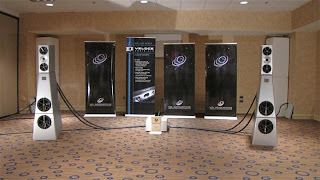 The YG room was consistently the most crowded room at AXPONA, and for good reason. This second photo, also from Jon, is a wider shot of the Audio Power Labs 833-TNTs I just blogged about. This will give you a better sense of the size of these BIG tube amps (although I still love Ross Bennett's more romantic shot of the massive, glowing tubes).